The Streatham & Brixton Chess Blog: From Who? To Whom? 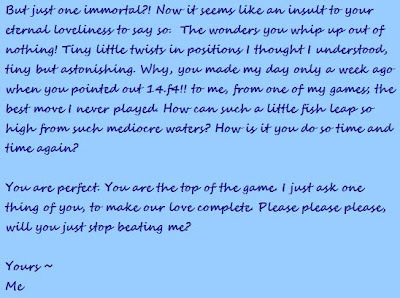 As I was leaving a certain chess venue in south London, just the other week, I found upon the floor a scrawled up piece of paper, with a hand-written letter on it. 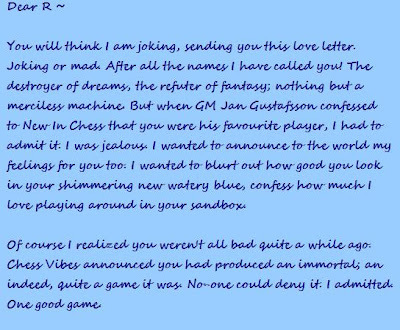 The letter seems to be about chess, and indeed is presumably from a chess player. Beyond that, I'm afraid I can't make head nor tail of it. Who can it be to? Who can it be from? Nigel Short to Nigel Short? Nigel Short to Lubosh Kavalek? I remember the game mentioned. It was a fantastic Winewar French featured in an article about less famous GMs and their beautiful games. Can't remember who played it though. I'll have a look and report back. I think it was Tom Chivers to Rybka. Am I right? Some good answers! Only one completely right one, ejh's.